Andrew Dervan understands what helped commerce in Zeeland tick during most of the 20th century. But the magnitude of his discovery wasn’t realized until he did some digging in pursuit of a newly discovered hobby that has since become his passion. Dervan is the featured speaker on Thursday, Dec. 6, at the Zeeland Historical Society’s annual membership dinner at the Colonial Clock Building at 201 W. Washington Ave., Zeeland. 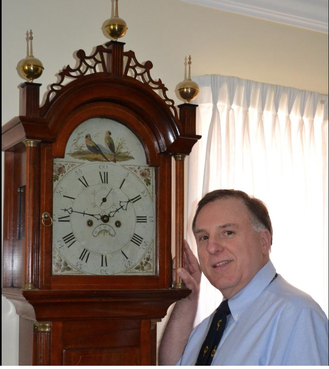 Dervan has published more than 30 articles on various clock and watch companies and clockmakers in the Clock and Watch Bulletin and Clocks Magazine in England, and has given many horological presentations at various National Association of Watch and Clock Collectors functions and civic groups. In 2011, he became NAWCC Fellow. Last year Dervan retired from DuPont Performance Coating. Dervan’s presentation will cover the individuals and organizations contributing to the clock industry, with a focus on Colonial Manufacturing Co., Herman Miller Clock Co., Trend Clock Co., Trend/Sligh Clock Co., Howard Miller Clock Co. and H.L. Hubbell, all from Zeeland. Dervan noted that in the 20th century, Zeeland became a clock-manufacturing center rivaling the region around Bristol, Conn.
Dervan acknowledged how furniture manufacturing became a popular industry in this region, with many companies manufacturing a wide variety of furniture and household items. In addition, many clock-making companies formed over the years. “People like Phil and Jack Miller of Howard Miller went from being among their peers to being head and shoulders above everyone else,” Dervan said. “They really overwhelmed everybody else because of their drive, organization and well-planned-out factory and marketing strategy in seeking their customers. Suzy Frederick, curator of the Zeeland Historical Museum that is operated by the historical society, said invitations have be sent to all 200 paid members of the Zeeland Historical Society. The public is also welcome to attend. The event, which is being underwritten by the Howard Miller Clock Co., will begin at 6:30 p.m. with a dinner buffet. The program starts at 7:45 p.m. The event, accessible at the Clock Building’s east entrance, is by reservation only. Seating is limited. Member cost is $8 per person; non-members $13. An informational flyer and RSVP forms are available at the Zeeland office of the West Coast Chamber of Commerce, 149 Main Ave.
“This is our annual meeting and membership drive,” Frederick said. “We thank our current members for their continued support and encourage others to join us. It’s an opportunity to introduce members of 2013 incoming society board. • An informational flyer and RSVP forms are available at the Zeeland office of the West Coast Chamber of Commerce, 149 Main Ave.